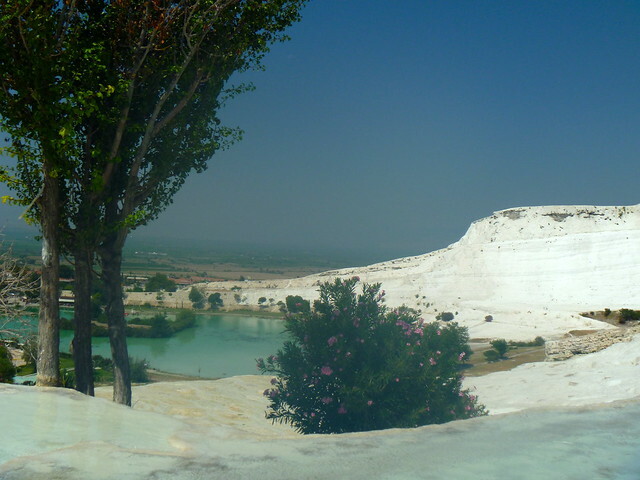 After two nights in Selçuk, I took the three-hour bus ride to the small village of Pamukkale. It was even smaller than I expected, truly a one-horse town that seems to be entirely sustained by the tourism industry. Accommodation options there were rather limited: the hostel I booked had pretty good ratings but was actually kind of weird, and the bathroom door in our dorm didn’t actually close. But honestly, it’s not like anyone is really going to spend more than a night there. 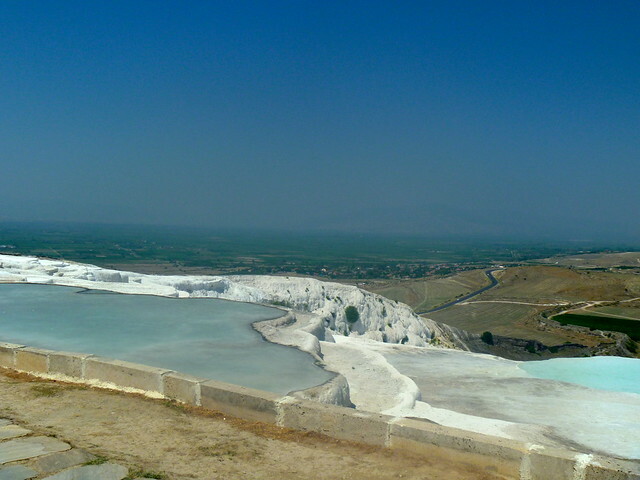 The main reason people go to Pamukkale is to see the famous travertines. 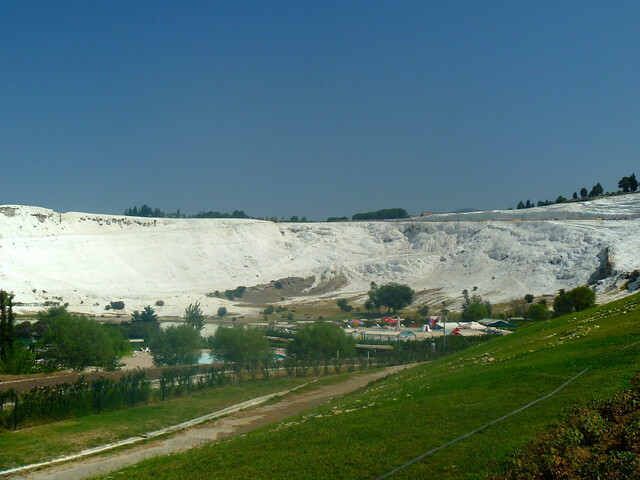 “Pamukkale” apparently means “cotton castle” in Turkish and that’s exactly what it looks like: a big, snow-white mountain made of calcite. 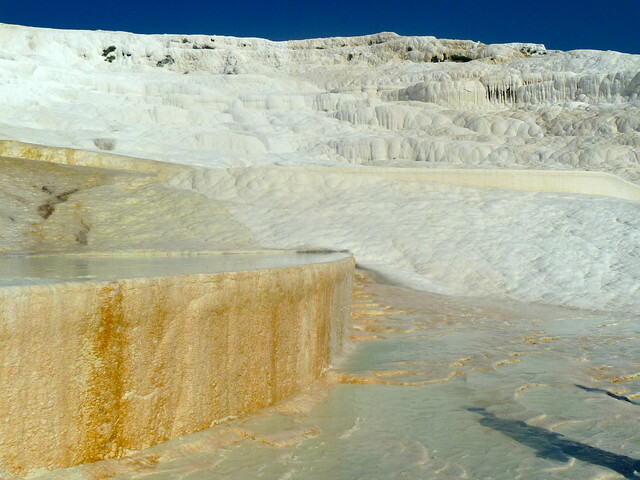 There are naturally occurring stepped terraces winding their way up the rock face and spring water flows over the surface, creating pools that visitors can wade in. 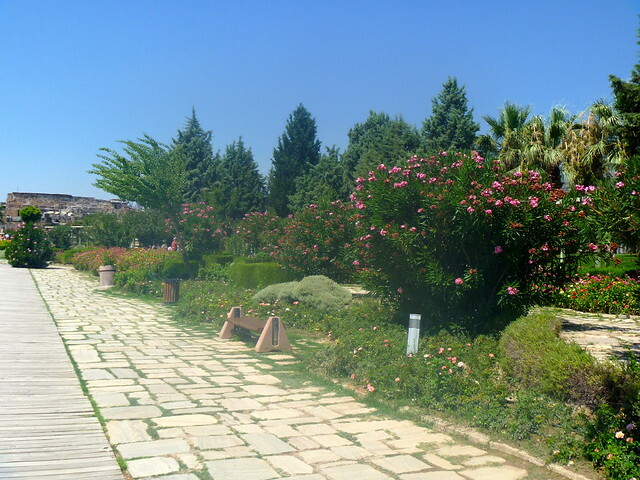 The plateau at the top of the travertines is the ancient city of Hierapolis. Hierapolis is actually quite different from the other ruins I’ve visited so far in Turkey, because most of the site is beautifully landscaped and it actually feels more like you’re walking through a gorgeous park or garden with some ruins scattered throughout, rather than an archaeological site. I actually ended up taking a little nap under a tree in the shady garden overlooking the travertines, which was very peaceful and a welcome respite from the unrelenting sun. Paragliding over the area seems to be a popular activity, because as I lay back and looked up at the sky I kept seeing them sailing overhead. It looked like fun, but I didn’t see anywhere to book at the actual site — I think it is something you would have to arrange ahead of time at one of the travel agencies on the main road. After exploring the ruins for a little while — mostly sticking to the shady areas — I descended the travertines again, this time stopping at each pool to wade and relax in. There are travertines/terraces all around the mountain, but visitors are only allowed access to the ones along the designated path in front. You’re also required to remove your shoes while walking over the rock, so be prepared and bring something to carry them in. I expected the rocks to be really slippery because of all the water, but the texture of them is really unique with natural ridges formed by the erosion, so you can actually get quite a bit of traction with bare feet. The top-most pool has a sort of irrigation channel carved into the rock above that creates a small waterfall, so that area was super crowded with people splashing around and taking pictures. 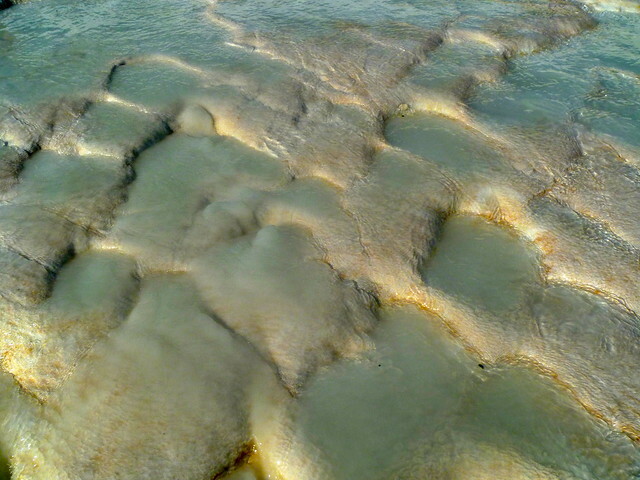 The upper pools also have very pebbly bottoms that can be a bit rough on the feet. I personally preferred the lower pools, which were also a little less crowded when I went, though that may just have been a fluke. 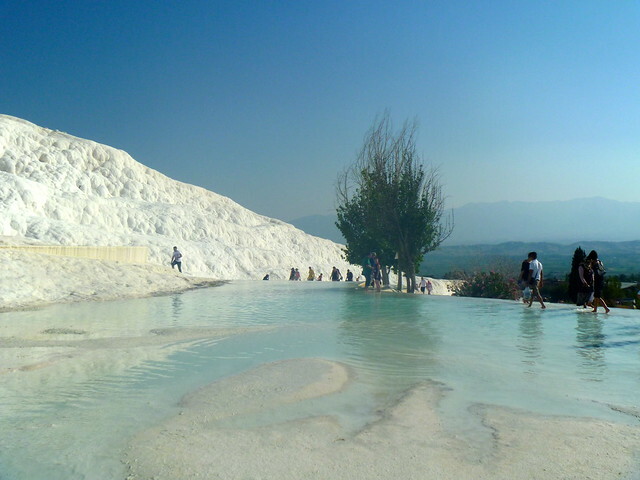 Some areas have soft calcium carbonate deposits in the bottoms of the pools, a very light grey mud-like substance that is supposed to be great for the skin as it contains lots of minerals. Thanks! These photos definitely don’t do the place justice; it’s pretty surreal and even more beautiful in real life! I just wish it had been less crowded…. high season here means it was packed with people. Really?? That packed? I thought it wasnt such a famous place! Either ways I would love to go, looks pretty interesting!